Buying, Selling, Building, or Relocating: You Deserve the Very Best! Julie Moran offers Full Service Real Estate Services designed to help you make your dreams come true in Real Estate. Real Estate Credentials and Designations: Million Dollar Producer, Awarded top 1% in company sales. Constantly top agent in the Company. Coldwell Banker Gundaker, St. Louis area's largest and most successful residential real estate firm, is owned and operated by NRT Incorporated, the nation's leading residential real estate brokerage company and a subsidiary of Realogy. Coldwell Banker: originally Ira E. Berry Company, founded in 1939, and for decades was a leader and innovator in St. Louis real estate. Gundaker Realtors, established in 1968, ranked among the top ten independent companies in the U.S.
"I always dreaded working with real-estate agents; they always reminded me of pushy salesmen. From the first time I met Julie it seemed like I had known her forever. She has always been supporting, helpful, and very knowledgeable. I don’t think she sleeps, I can call her at any time, she always available. She loves what she does and it shows." "Julie helped my wife and I buy our first home. We were brand new to the process and had absolutely no idea what we were looking for or where to start. Julie did such a tremendous job guiding us through the process and helping us figure out what features were important to us. Once we found the house we loved, Julie became a little bulldog and negotiated the price way way down. It was fun to sit back and watch her go to work. 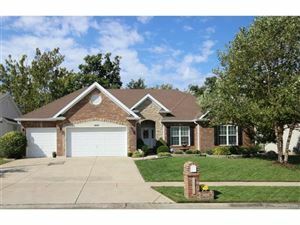 When we are ready to upgrade, Julie will for sure be the agent to help us sell this house and find a new one." "Julie helped us sell my Mom's home within 1 month of listing it after we had previously listed it for 2 years with 2 different agents. She is knowledgeable and honest. I would highly recommend her." "Julie made herself available on short notice many times to show us homes we were interested. Julie was also very patient as we changed our requirements on type of house we wanted and she was there for us as we tried to find the exact right home for us. In the end she helped us buy a parcel of land and built a new custom home and she was knowledgeable about builders in the area to provide advice there as well." "Julie did a great job of listening to us and determining what we were looking for in a home. She conducted a thorough property search and presented homes for review that fit our needs. Once we toured the homes, Julie let us explore the home without interjecting her own thoughts. She let us form our own opinion of the home. Once the tour was completed she would review what we viewed in the home and pointed out aspects that we may have missed. She did not waste our time showing us homes that we were not interested in seeing. I have recommended Julie to several people and will continue to do so. I also will call her again in the future when we look for another home ( to sell and buy)." "Julie is a residential Real Estate expert. She was patient with my request to see many homes; demonstrated knowledge about conditions of the homes and had contracting experts to consult about conditions we wondered about. Julie referred me to a great loan originator, who doggedly stayed the course when complications came up (the home I bought was a "reverse mortgage repossession.") I found the right home, Julie made arrangements to act quickly even though she was out of town and gave me decisive advice that resulted in a successful offer for the house, when other offers fell through. As a result of working with Julie, I have a home that is well suited for me at a very good price in our market." "We cannot say enough about how great our experience with Julie and Erica was when selling our home. From the time they came over to take photographs to the closing at the title company, the level of service was impeccable. Julie’s photographs were fantastic and plentiful and really showed our home’s assets. We had many questions along the way and Erica was more than available to answer our questions and help with anything she could. Our home sold after four days on the market and I truly believe it was due to the excellent photographs and work on the front end by Julie and Erica. The negotiation process, while stressful, was as smooth as possible and all of their recommendations were excellent. I would recommend Julie and Erica to anyone… and I will. They are professional, up-front and extremely detail oriented, which all go a long way when selling (or buying) a home."